Pokhara is the second largest city in Nepal as well as the second most popular tourist destination in the country. 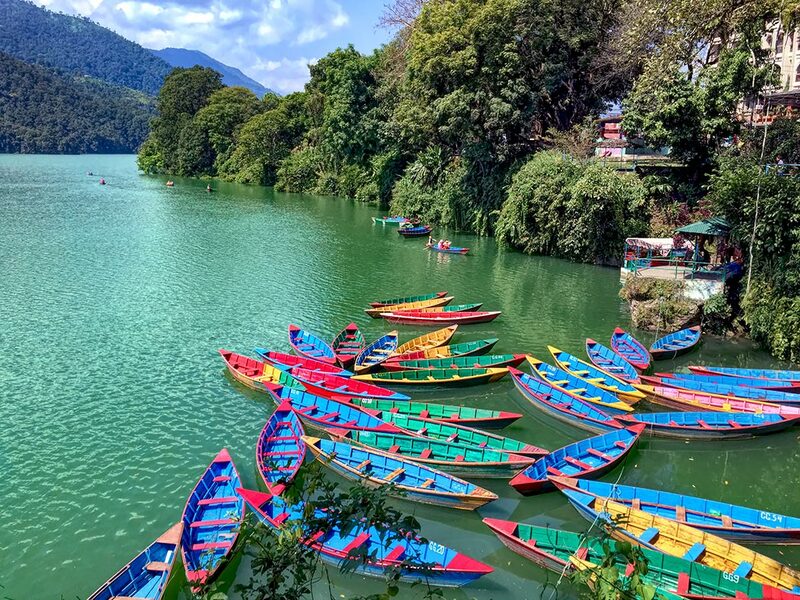 I’ve visited Pokhara at least ten times over the years and it offers much for tourists, but for me the city’s most impressive sight has always been the colorful wooden boats on Phewa Lake. The boats in the above photo are available to rent for the day, with or without a man to row. From the center of the lake, on days when skies are blue, boaters are treated to a spectacular view of the Annapurna Himalayas reflected into the blue-green waters. A short distance away, at the end of Barahi Path (road), another cluster of colorful wooden boats line the shore of Phewa Lake. These somewhat larger boats ferry groups to a small island in the center of the lake that is home to the revered Barahi temple. Devoted to the Goddess Durga, this temple is worshiped by both Hindus and Buddhists. The boats make a complete circuit of the tiny island before rowing up to a dock where passengers disembark. Many visitors make a day of it on the island, praying for health and good fortune, enjoying a picnic lunch, and feeding the fish that flock to the shore under the protection of the goddess. ← PHOTO: Monkeys, Monkeys, Everywhere! this is beautiful – love your blog. Thank you so much Sandy. Glad you enjoyed my photo. Nepal looks so beautiful and this post shows that Nepal is a worthy tourist destination. This country has many places which are amazingly beautiful. Thanks for sharing this post this is really very nice and amazing. Wow this is beautifil! I can’t wait to get to Nepal sometime soon. A wonderful story and beautiful photo that brought memories of past adventures in Nepal. You’re very welcome, Aida. You’ve been following me fora while, so you may know how attached I am to Nepal, and with each visit my attachment grows deeper. I hope you do get there! It’s a wonderful destination. This photo is gorgeous… It’s not even the beautiful boats, it’s the whole scenery. I’m in love with it! Thanks Lauren. I hope you get to go as well – you’d love it, I’m certain. That’s a very happy looking photo! Reminds me of a bag of skittles spilling out on a surface. I love that analogy, Paul! Amazing Barbara. I had no idea Nepal looked like this; I see big mountains of course but more stark terrain. Some of my readers live in Pokhara; would be cool to visit and see them. And to see this inspired lake. Loving those boats too. Thanks Ryan. Really hope you get to visit Pokhara someday. It’s one of the great places in the world.